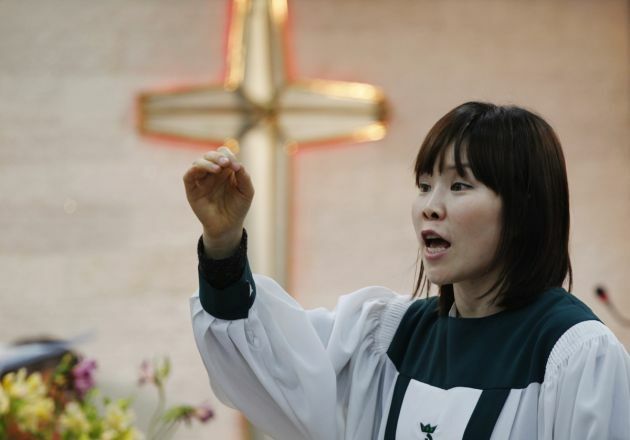 (Photo: Reuters / Lee Jae-Won)A North Korean defector living in Seoul conducts a choir during a divine service held to pray for peace and reunification of the divided Korean Peninsula at a church in Seoul April 7, 2013. North Korea, angry about new U.N. sanctions imposed for its third nuclear weapon test in February, has made increasingly strident warnings of an imminent war with South Korea and the United States. The latest missile firing by North Korea and military exercises involving the United States and South Korea have "raised tensions in the region to a dangerously new high, says the World Council of Churches. So, the WCC has reiterated an urgent appeal by its executive committee in June for all States engaged in the "perilously escalating military confrontation" in the Korean region to refrain from further escalation. The council which represents 560 million Christians worldwide is calling for countries engaged in the Koran region to "pursue instead initiatives to reduce tensions and to create a window for new dialogue initiatives." It noted the reportedly successful intercontinental ballistic missile test by North Korea on July 4, and the joint US-South Korean ballistic missile drills it provoked. The BBC reported July 5 that the United States has confirmed that North Korea tested a long-range missile which some experts believe could reach Alaska. U.S. Secretary of State Rex Tillerson called it a "new escalation of the threat" and warned that Washington "will never accept a nuclear-armed North Korea". Pyongyang had claimed the day before to have successfully tested an intercontinental ballistic missile (ICBM). In response the United States and South Korea conducted a joint military exercise on July 5. A statement by the two countries' militaries warned that "self-restraint, which is a choice, is all that separates armistice and war" and that their drills showed "we are able to change our choice". The two Koreas are technically still at war as the 1950-1953 Korean War ended in an armistice with a cease-fire still to be signed. Peter Prove, director of the WCC's Commission of the Churches on International Affairs said the latest missile firing and exercises have "raised tensions in the region to a dangerously new high." As the WCC Executive Committee has recently observed", noted Prove, "confrontation by military or other means carries far higher risks of conflict – with catastrophic consequences for all people of the peninsula and the region – than prospects of leading to peace." A sustainable peace, and the peaceful denuclearization of the region, cannot be achieved through mutual provocation, but only through dialogue, the WCC said. "In this particularly dangerous moment, self-restraint is indeed all that separates armistice and war. We call on all parties to beware of this perilous threshold." 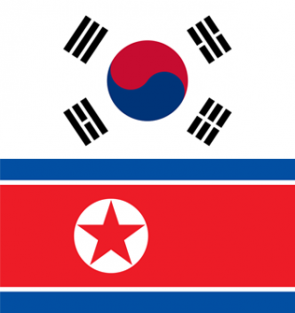 In a statement it released on June 11, the WCC noted that it has long been engaged in efforts for peace, reconciliation, reunification and development cooperation on the Korean peninsula. "Especially since the 'Tozanso Consultation' in 1984, the WCC – in partnership with the National Council of Churches in [South] Korea (NCCK), the Korean Christians Federation in North Korea (KCF), the Christian Conference of Asia (CCA) and several other ecumenical partners – has encouraged and facilitated encounters between Christians from North and South Korea," said the WCC.